Power Steering Pump Noise When Turning - What Could It Be? Power Steering Pump Noise When Turning – What Could It Be? Things seem to be going well when you go to turn a corner and your car makes a whiny noise. This can cause an alarm as you try to figure out what is happening. Here are ways to check your ride so you can accurately diagnose the problem. The first is to identify precisely when the noise takes place. Is it when you go to begin the turn, during the turn or both? If you answered yes to any of these questions, most likely it is power steering pump noise. 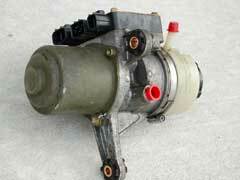 Power steering pump noise comes in the form of a whine and can happen when you rev your pump. There are several reasons that cause the noise. One is when the fluid is cut off to the pump, which over time can cause metal to metal contact as the fluid breaks down from high temperatures. Additionally, there might be times when the pump increases in speed and the fluid cannot keep up. As a result, this will create a vacuum inside the pump where oil will fill to compensate for the lack of fluid. When you notice that it is power steering pump noise, you’ll want to take it to the mechanic unless you have experience handling these type of issues. The mechanic will inspect your parts and other components like your power steering hose or electric power steering pump if applicable to see what is causing the problem. Usually, this will not result in a replace power steering pump situation. The only time the pump would break according to Third Gen’s website is due to heat and oil viscosity breakdown. Therefore, be mindful of that when you take it to the shop as some mechanics try to tack on services you don’t need. One of the best ways to prevent this issue is to inspect your components regularly and to practice safe driving. While some of the issues can spring up over time, regularly taking your car in for services like a power steering flush can help reduce the chances of you encountering power steering pump noise.